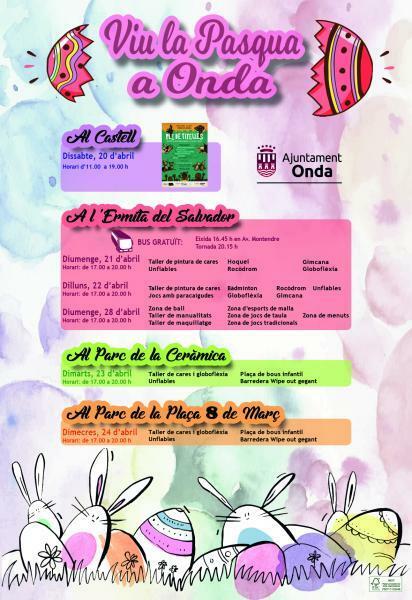 Activitats infantils durant la pasqua a Onda. HORARI: De 11h a 19h. - TALLER DE PINTURA DE CARES. - TALLER DE PINTA CARES. - PLAÇA DE BOUS INFANTIL. - BARREDERA WIPE OUT GEGANT. LLOC: PARC DE LA CERÀMICA. LLOC: PLAZA 8 DE MARÇ. - ZONA JOCS DE TAULA. - ZONA DE JOCS TRADICIONALS. - ZONA D'ESPORTS DE MALLA. EIXIDA: 16.45h en Av Montendre.